If you're looking for the best stocks to invest in steel, there are two companies that are head-and-shoulders above the rest. Steelmaking is hard and expensive. It's also a tough place to invest. Source: U.S. Steel. The steel industry is one of the most "boom or bust," with huge fixed costs, and supply-and-demand shifts that can move a company from record profits to near bankruptcy in mere years. That can make it difficult to find the best stocks to invest in steel. Factor in increased international competition for what had largely been a domestic product, and it's even harder. However, there are two steelmakers that have stood head and shoulders above their peers for years: Nucor Coporation (NYSE:NUE) and Steel Dynamics (NASDAQ:STLD). 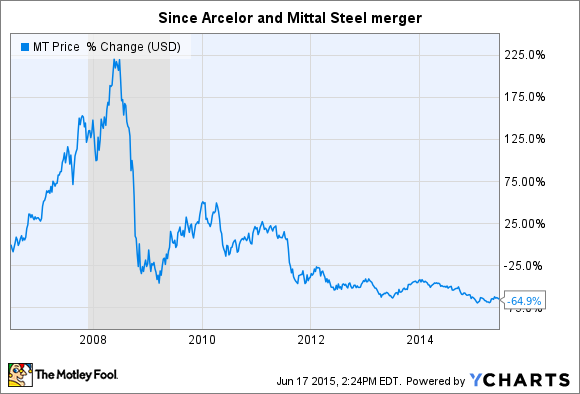 Furthermore, there's another multinational steel and iron maker, ArcelorMittal (NYSE:MT), that has been beaten down, and may be close to turning things around. Let's take a closer look at these companies. Whether you're looking for a long-term income growth investment or a turnaround opportunity, one of these three might be right for you. The biggest challenge for steelmakers is managing the demand curve. Steelmaking is energy- and labor-intensive, and has high fixed costs. This means that each company must manage its operations as efficiently as possible. 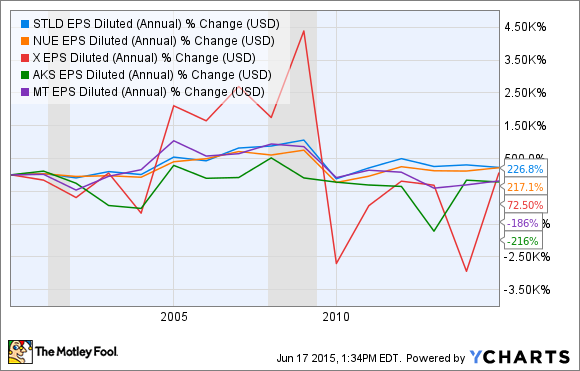 STLD Net Income (Annual) data by YCharts. 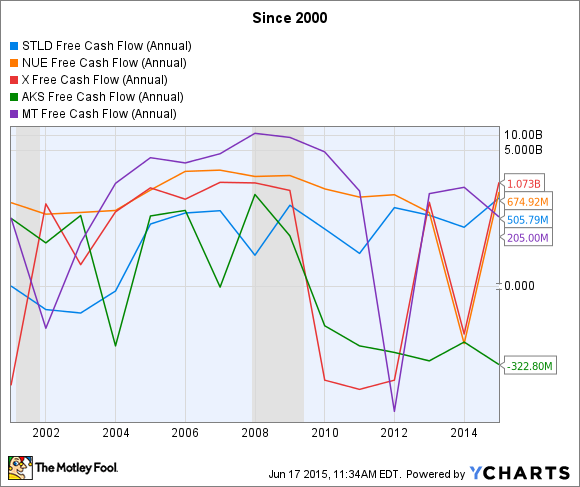 STLD Free Cash Flow (Annual) data by YCharts. You have to be careful with free cash flow, because it can also be generated by asset sales, debt, and stock offerings, all of which can be detrimental to shareholder returns if management doesn't use the cash in a manner that increases the company's ability to grow earnings. As the chart above shows, Nucor and Steel Dynamics have had much more consistent positive free-cash-flow generation than their peers. 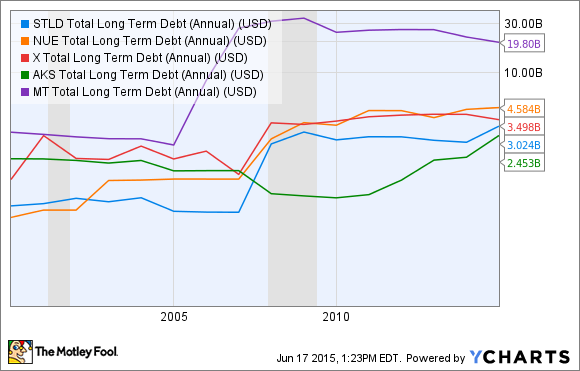 STLD Total Long Term Debt (Annual) data by YCharts. STLD Revenue (Annual) data by YCharts. But which companies have been most successful at converting those revenues -- maybe the single most-important long-term metric -- into earnings per share? STLD EPS Diluted (Annual) data by YCharts. 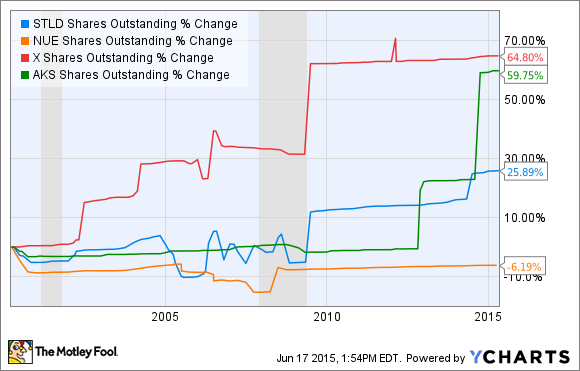 STLD Shares Outstanding data by YCharts. I've omitted ArcelorMittal from the chart above because its change in share count -- up more than 1,200% -- was a product of the merger, making it a bit less straightforward than the others to compare. At any rate, when companies issue shares to raise cash for operations, that's not good for shareholder returns. That's been one of the biggest killers of shareholder returns for this industry. 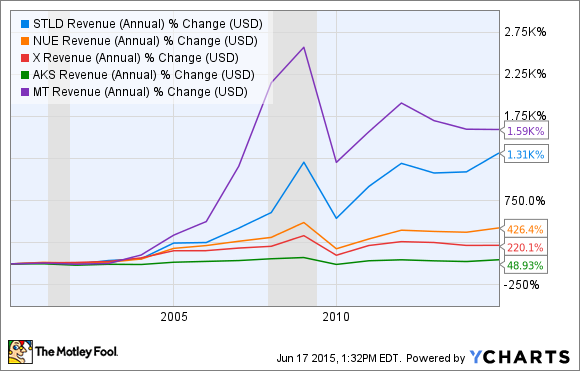 Nucor and Steel Dynamics have just been better at managing capital and avoiding major losses in the downturns. That's the biggest reason they've been solid investments, while the others have struggled. Since the recession, this largely European company -- though it has operations in multiple countries, including India and the U.S. -- has struggled. The company also produces iron ore, and iron prices have been terrible for a few years. While this is good for the company's input costs, it's not good for the production that it sells on the open market. 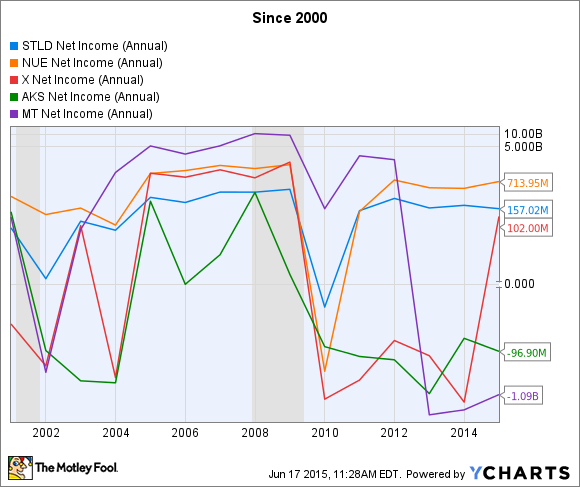 MT Net Income (Annual) data by YCharts. 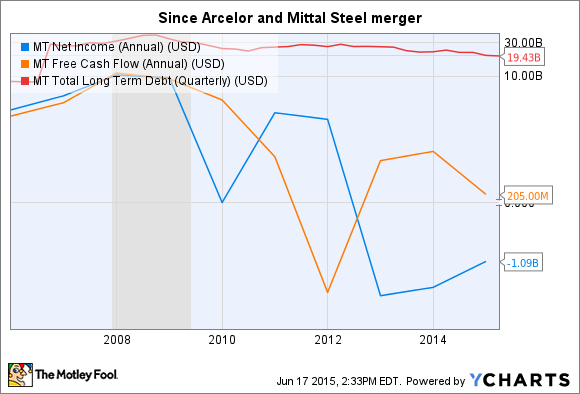 In other words, ArcelorMittal is well positioned for the cycle to turn in Europe. Cyclical industries can be very hard to invest in, because timing is key. However, investors with a long-term focus should give Nucor and Steel Dynamics a close look, because both have proven that they can avoid the harm of the downturn that has killed the competition, even as the market becomes more competitive and global. If it's a turnaround you're looking for, then ArcelorMittal looks like that's exactly the case today. Its recent losses may make it look unattractive, but the massive writedowns tied to plant closures are masking consistent free-cash production, and the huge debt reduction during the past several years. I'm not saying a turnaround is imminent -- it could take a few years to play out -- but the company looks ready to profit when the market does turn in Europe.